The rock quarry along John Bragg Highway just west of Woodbury has been the subject of a number of complaints. When there is a rock quarry operating in the vicinity of your home or business, there's a pretty good chance you will experience some inconveniences from time to time. One of them, and the most frequent, is noise, coming from drilling, blasting and the traffic of heavy vehicles coming in and out of the operation. The other, and perhaps the most serious, is damage to the structure and foundation of your home or business, and the property on which it sits. The rock quarry located on John Bragg Highway just west of Woodbury has some nearby residents in an explosive mood. One of them is Don Bryan, who lives on Murfreesboro Road. "It's too close to residential property. The blasts are damaging houses," Bryan said of the quarry. The buiness is owned and operated by Wells Group Inc., whose headquarters are in Manchester. Bryan said they should not be allowed to operation a quarry at the location. "It's trashing our landscape. The hill has been part of Woodbury for centuries. The property is not properly zoned for this type of excavation," he said. Bryan added the damage as a result of the blasting which takes place at the quarry is causing him a financial hardship. "It is ruining our property value. I've got cracks in my driveway, shingles knocked off my roof, cracks in my ceiling, and the house is only six years old." Of greater concern is the effect it is having on the well-being of family members, Bryan said. "My dad is a nervous wreck. He suffers from Alzheimer's, and the blasting only makes it worse." Bryan said he and some of his neighbors would like to put an end to the quarry's operation. "My goal is to stop it, to shut it down, before it harms more people and homes," he said. The rock quarry is required to have both air and water permits from the Tennessee Department of Environment and Conservation, as detailed below, according to information received from the State of Tennessee. A rock quarry requires an air permit from the Department of Environment and Conservation's Division of Air Pollution Control. It would first require a construction permit, then must get a state operating permit within 30 days of startup. The Cannon County Redi-Mix site currently has a state operating permit that covers dust suppression from crushing operations, as well as emissions from two diesel engines that power the operations. The department does not have authority over blasting, and these permits do not cover dust from blasting. People can find more information about these permits and their requirements at these websites: http://tn.gov/environment/permits/airconst.shtml (Construction Permit) / http://tn.gov/environment/permits/airoper.shtml (State Operating Permit). A rock quarry also requires an individual National Pollutant Discharge Elimination System (NPDES) permit from the Department's Division of Water Pollution Control to regulate the discharge of treated wastewater into streams. You can find more information on this permit and its requirements on our website at: http://tn.gov/environment/permits/npdes.shtml. State inspectors have visited the site to determine if it is in compliance with environmental regulations put in place for environmental protection. According to the state, the site was operating without the required NPDES permit, and the department's Division of Water Pollution Control issued a Notice of Violation in June 2010. The Division of Water Pollution Control has communicated what information is required in the permit applicant, though it has not received an application at this time. Prior to the quarrying activities beginning, the site operator was planning to construct a ready-mix concrete facility. They got coverage under a construction stormwater general permit for grading work to build that facility, then decided to convert the site to a quarry. The department's Division of Air Pollution Control issued an enforcement order in December 2009 for failure to timely submit the required Visible Emissions Evaluation and for making late application for the required state operating permit. • March 2008 - complaint about a silt fence was pushed down by wood debris. It was fixed while the department's inspectors were on site. • February 2009 - complaint questioned whether the site had air permit and appropriate dust control measures. The department's Division of Air Pollution Control conducted its annual inspection following the complaint and issued a notice of violation on April 2, 2009). Same complaint stated the concrete plant also was crushing dirty rock on the river bank and water leaving the property needed to be checked. The inspector found no crusher or work done near the river and no means for water to leave the site. The Department of Commerce & Insurance does not require any permit. However, TCA 68-105-103(m) requires notice be given to the Department of Commerce and Insurance at least 72 hours before blasting operations commence. Blasting firms and blasters must be registered with the Dept. of C & I in accordance with T.C.A. 68-105-101 et seq. Local governments usually determine whether a quarry can be established in their jurisdiction. That is considered a zoning issue. The Department of Commerce & Insurance does not issue nor require blasting permits, but notice is required. 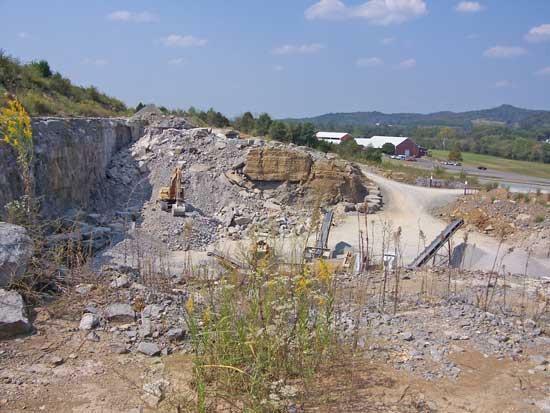 Operators of permanent blasting sites (aka quarries) are required to comply with all state rules and laws regarding blasting operations provided in T.C.A. 68-105-101 et seq. In particular, the blasting standards in T.C.A 68-105-104. If a resident believes either their physical person, their home or their property has sustained damage of harm caused by a singular blast or continuous blasting, they may file a complaint with the Department of Commerce & Insurance. State investigators will visit the site and inspect the blasting operation, including getting seismograph measurements. Citizens may file a complaint by calling (615) 741-1322 or online at http://tn.gov/commerce/sfm/documents/complaintform06.pdf. Unfortunately the quarry is located outside the city limits of Woodbury and there is no zoning in the county. The Cannon County Planning Commission is having their regular scheduled monthly meeting tonight (Tuesday) at 6pm upstairs in the Cannon County Courthouse. If the quarry is located outside of the city limits how does the city police set at the throughfare at the Arts Center and check for speeders? They are at that spot directly past the bridge or in the parking lot of the Arts Center several times a week early in the morning. Either the quarry is inside the city limits or the police are out of their jurisdiction. Can anyone tell me which it is? The Arts Center is in the city limits the rock quarry is not, the Arts Center has been in the city limits almost since it opened. The Arts Center is past the Rock Quarry, so how is one in the city limits and one is not? I think doolittlerd77, it's because you can draw lines on a map any way you want. Apparently that is true Kevin. I guess the city limits run diagonally. But, I still am not sure how that is possible because you enter a 45 mph speed zone before you get to the rock quarry which must mean at the point you enter into the city limits. Even if the lines are running diagonally, it looks to me that a portion of the rock quarry has to be inside the city limits or the speed zone is in the county and not the city. Recalling the days when JC was operating full bore south of town---blasting shook most nearby houses, rattling window panes and no doubt creating structural problems along with wall and ceiling cracks. Crushing days brought plumes of dust drifting downwind, if breeze from southeast. I am sure the Haley's felt the blasting in that area and dusted often to keep things clean--bound to affect the marketing of the house and property. By the way, I checked. The city limit sign is prior to the rock quarry. That is why the police can set at the Arts Center and the median intersection because they are inside the city limits. Unless someone can explain why it is not, the rock quarry has to be inside the city limits based on the sign. Again I think it goes back to how the property lines are drawn. Obviously the state highway is one different property than is the rock quarry. For example, and if I am not mistaken, the flea market, drive-in and mini-storage business are all in the county, whereas the car wash is in the city. As they are all in close proximity, one might assume they are all in the city.